Jayasree Saranathan: Did 'Mohan Dera' become Mohenjo-Daro where Kartik Purnima was celebrated? Did 'Mohan Dera' become Mohenjo-Daro where Kartik Purnima was celebrated? Kartik Purnima, the day of full moon in the month of Kartik is an important occasion in Somnath temple in Saurashtra. The very name Somnath evokes strong emotions in the Hindus for the numerous assaults struck on Somnath temple in the past. But what many had forgotten in the din is the silent sojourn of Soma, the Moon across the temple of Somnath on every Kartik Purnima, in a gesture of paying his obeisance to his lord Somnathji. 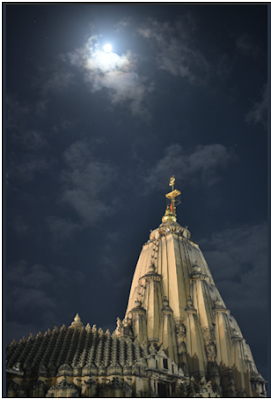 The Full Moon crosses the temple exactly overhead only in the month of Kartik! The etymology of Somnath being ‘lord of the Moon’ and the legend of Moon being cursed by Daksha Prajapati to lose lustre and regain it by the grace of Lord Shiva, it is perfectly fine that the Full Moon crosses the temple once a year. But how this happened has only one answer that the original and the olden builders of this temple had planned it to be so and carefully selected the site for the temple. One can only deduce that the legend had already existed and people had celebrated it by aptly choosing a site for Lord Somnath so that Soma in full glow can cross the temple in the month of Kartik. A surprising parallel to this temple exists in Mohenjo-Daro, of all the places in India or anywhere in the world! 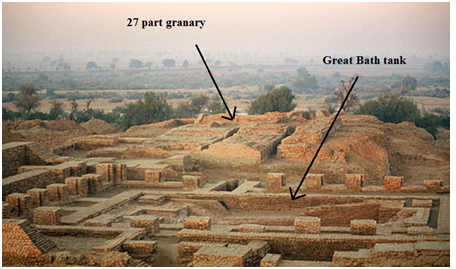 One may be aware of a temple like structure along with a tank - what researchers call as the Great Bath, in Mohenjo-Daro. But the unnoticed fact is that both Somnath and Mohenjo-Daro are situated more or less along the same longitude. Somnath is situated at 70.4090° E while Mohenjo-Daro is at 68.1375° E, within 2 degrees apart. This means when the Full Moon crosses Somnath in the month of Kartik, it will also be seen crossing the temple like structure of Mohenjo-Daro! To be more precise, exactly 8 minutes after the Kartik Full Moon touches the top of Somnath, it pays its obeisance at the temple of Mohenjo-Daro. Mohenjo-Daro being a planned city, this locational feature also seems to be a planned one, much like Somnath. The legend of Soma with his 27 wives also seems to have been recreated in this temple of Mohenjo-Daro as one can see an arrangement of 27 formations in Mohenjo-Daro close to the Great Bath. 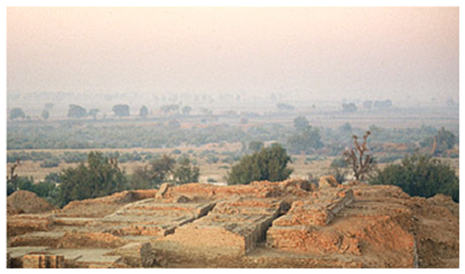 In the picture below, the water tank excavated in Mohenjo-Daro is seen in the forefront with a massive brick structure having 27 parts at the background. On closer examination one can see 27 distinct parts arranged in 3 rows of 9 each. Each one of these 27 structures has separate foundations and arranged in East – West direction in 3 rows. It is also found that there were sockets for wooden super structure and doorways. This shows that this was originally a building having 27 distinct enclosures or partitions. Initially it was thought (by western researchers) that this structure could have been a granary! But this structure was too close to the water-outlet of the Great Bath tank! How could a granary exist so close to a water outlet? Further examination shows that water had flowed around the 27- part structure. This shows that the 27-part structure was surrounded by a kind of moat filled with water. The water was drawn from the Great Bath tank nearby. First of all, the number 27 sounds interesting. Why is it not 28 or 26 or 25? Why they made only 27 structures and arranged them in groups of 9? This sounds familiar with the number associated with 27 stars of the zodiac. The stars also are arranged in groups of 9! Huge column of water (huge because the size of the outlet is quite unusual and would allow heavy rush of water from the tank) surrounding this structure reminds one of the concept of "Akash Ganga" – the Milky way in which the 27 stars of the zodiac are swimming! In a striking resemblance, wells numbering 27 were dug in Chennai in the year 1818. An inscription found in a well in the temple of Goddess Periya Pāḷayatthamman in Royapettah in Chennai says that this well was one among 27 wells constructed by the then Madras Collector, Mr Ellis in 1818. He did not just do this donation as a charity. He had followed the rituals and inaugurated them at an auspicious time. Here also why the specific number 27 was followed is a question. Was there a practice to offer water to the 27 stars or star lords? Or was it a symbolism for keeping the stars floating in the celestial waters? Was that the reason the tank was constructed in Mohenjo-Daro too close to the 27 part structure so that water could be let out on auspicious occasions? In Mohenjo-Daro the length of the 27-part structure shows a unique connection to the zodiac. Lengthwise there are 3 rows in east – west direction with a uniform length of 4.5 metres. The breadth varies for each row as 8 m, 4.5 m and 6 metres. The uniform length of all the formations gives an impression of equal length of the star- span in the zodiac. The span of a star is 13 degrees and 20 minutes. Converted into minutes it is 13 x60 = 780 minutes + 20 minutes = 800 minutes. If we divide the zodiac of 360 degrees by the length of a part of the 27 part structure (360 / 4.5) it gives 80 parts. This is one tenth of the actual span of the star in the sky! Is this a just a coincidence or a calculated one? To show that the entire complex housing the tank and the 27-part structure are part of a temple, let me make a comparison with a famous temple –a functioning temple – the temple of Meenakshi at Madurai! Similarities between Mohenjo-Daro and Meenakshi temple. Let us first take a look at the Mohenjo-Daro plan. 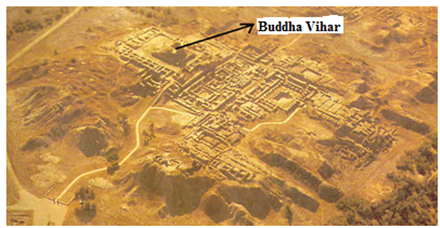 In the aerial view shown above, the front structure named Buddha Vihar was formed 2000 years ago. That was not originally the Indus structure. The almost square shaped structure in our right side was the original structure built at about 2600 BCE. The directions, the tank and the 27 part structure are highlighted in the picture below. The area shown as Main structure must have housed a main building which is now lost. What looks strange is that the tank is not in the expected Vāstu direction of North East but in South East. Almost all olden temples of South India have the temple tank in the North East. The only exception is the Meenakshi temple of Madurai! This temple was supposed to have been built soon after the Pandyas settled down after the 3rd and last deluge which coincided with the deluge at Byt Dwaraka at the end of Indus civilisation. The famous tank of this temple is in the south east direction! 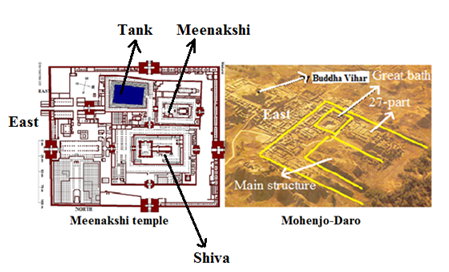 A comparison of the temple plan of Meenakshi Amman and the temple like structure in Mohenjo-daro is shown below. One can notice the similarities in the 3 main structures – the tank is placed in the same region of South East in Meenakshi temple and in Mohenjo-Daro as well. The shrine of Meenaskhi corresponds to the 27 part structure of Mohenjo-Daro. The main shrine of Shiva corresponds to that part which is now vacant but looks suggestive of a lost structure in Mohenjo-Daro. This comparison is shown here to drive home the point that the 27 –part structure could have been a place of worship! 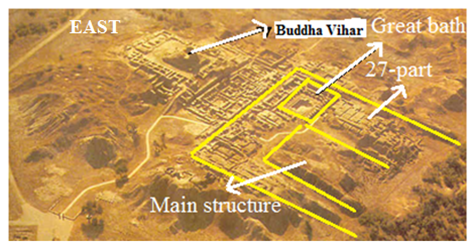 The similarities also offer proof for similar school of architecture present in wider Bharat in the 2nd millennium BCE. Mohenjo-Daro, a temple for Krishna? The worship of 27 Nakshatras as Nakshatra Purusha vrata was vogue in olden times. The last chapter of Brihad samhita explains how the 27 nakshatras were worshiped as the body of the Nakshatra purusha starting from Moola as the feet of Nakshatra Purusha in Sagittarius. Even today, Sagittarius is called as "Nakshatra māsa" in Dwaraka. 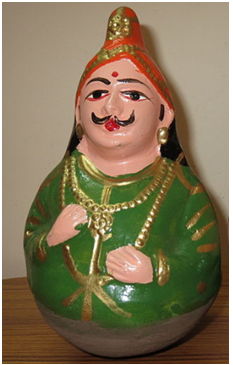 The Nakshtra Purusha is identified as Lakshmi Narayana in a narration that involves Rudra and Narada. The worship of Narayana in Mohenjo-Daro is not odd given the fact that the very name Mohenjo-Daro is identified as “Mound of Mohan” Only Krishna was known as Mohan among all deities. Incidentally Dera and Deri are the names for temples in Gujarati language and continue to be in use in rural Gujarat. The word Dera has wider presence beyond Gujarat as known from the name Dehradun. Dehra in Dehradun refers to ‘camp’. The reference to Dera or Deri as a temple and also a tent seems to have its origins to the times of Krishna as Krishna kept changing places before finally settling down in the newly built Dvārakā. The same name Dera or Deri appearing in the names many Harappan sites raises the possibility of those sites being camps for workshops, though some of them may have acquired the name from later day personalities. Among them Mohenjo-Daro has a unique position by virtue of the name Mohan. It was Dera or Deru of Mohan which later became ‘daro of Mohan’. In Pāli language ‘of Mohan’ is spoken as ‘Mohanasa’. This seems to have become Mohanja, in course of time. The wider presence of Pāli for millennia before the Common Era could have brought out this change to the name of this site. Associating Kartik Purnima with Krishna is still in vogue today. Krishna and Radha were supposed to have danced Rasa on this day. Perhaps in times soon after Krishna, people had retained that memory and Mohan Dera (Mohenjo-Daro) was built to glory him as Nakshatra Purusha. The locational preference around the same longitude of Somnath, popularly known as Prabhas where Krishna laid down his life could have been a cause for building Mohan Dera in more or less the same longitude. One cannot ignore the fact that Mohenjo-Daro is dated around 2500 BCE, a few centuries after the death of Krishna which marked the start of Kali Yuga. The memory of Krishna worshiping Somnathji on Kartik Purnima seems to have been taken over to Mohan Dera where Krishna himself was worshiped as Nakshatra Purusha on Kartik Purnima. The 27 part structure has no other plausible justification than this. So far I have not come across any ancient material linking anyone from Indian mainland with sentinel people. Ramayana and Mahabharata narration on southward countries go via Indra dweepa and Swarna dweepa (Thailand - Myanmar - Indonesia) by not touching Andaman - Nicobar. I think by the way their genetic pool has remained isolated for 40K + years, it means they were all alone and isolated. Perhaps they were cannibals and hence avoidance of their territory by others. You may look for reference to cannibals in texts in that part of the world. Is Sabarimala a secular temple? Tipu Sultan assaulted natural resources too.